Spaghetti all'Amatriciana . . . 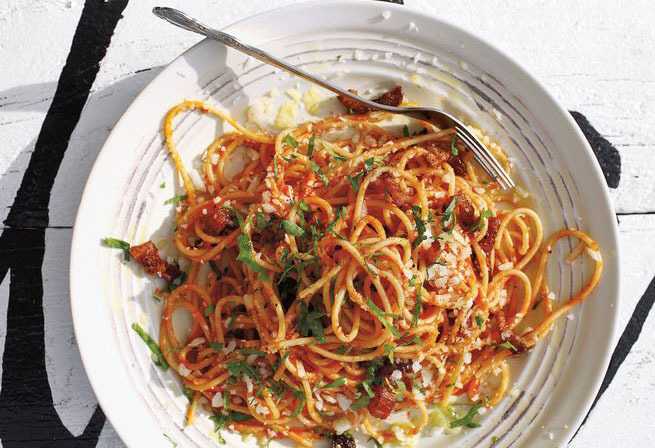 Chef Rachael Grossman of Artigiano in Portland produces a flawless version of this Italian pasta classic, which uses a slow-simmered tomato sauce infused with lots of bacon. This recipe first appeared in our June/July 2012 issue along with Dana Bowen's story Food of the People. Heat bacon in a 6-qt. saucepan over medium heat, and cook until its fat renders and bacon is crisp, about 15 minutes. Using a slotted spoon, transfer bacon to paper towels to drain; set aside. Add butter to pan, and then add carrots and onion; season with salt, and cook, stirring, until soft, about 6 minutes. Add half the garlic and rosemary and sage, and cook, stirring, until fragrant, about 2 minutes. Add wine, and cook, stirring, until evaporated, about 5 minutes. Add tomatoes, and bring to a boil; reduce heat to medium-low and cook, partially covered and stirring occasionally, until reduced and thickened, about 2 hours. Remove and discard rosemary and sage, and transfer sauce to a blender; puree and then return to pan. Stir in 3⁄4 of the reserved bacon, along with remaining garlic and oil, pepper, and chile flakes; keep warm.